Let's hear about those January calves! I think Acorn is due in January. Maudie + Lucy, my two Jersey cows, are due January 2nd! First timer over here (me, not the cows!) and I'm getting nervous. I just ordered X-Zelit, after reading all the favorable reviews and realizing that my girls were going to be highly susceptible to MF based on their ages and having been dry for a year before I bred them. Oy. Wish me luck! And any rookie cow-owner advice before calving! It's way too late for us now to worry about X-Zelit, but was it hard to get? Expensive? I inquired on their website and received some kind of email response, but never got farther than that. Jersey bottle heifer, Charlotte and red lineback cow, Emily, due in late Nov/early Dec.
Glad you were able to get it lined up! Our girl is due Friday, if the date mentioned by the sellers is right on (she was bred live cover). She doesn't sound like a serious candidate for MF, but I'm always a nervous ninny! We do have a Jersey heifer, so it's something I'll definitely keep in the back of my mind once she's bred. Hope everything works out great for you and your girls! How exciting snowhaven! Hope you have a beautiful calf and happy mama cow soon! Me!!!! My little jersey I got from Dusty is due on the 30th!!!! We were originally told Penny was due in July. Obviously, they got that one wrong! 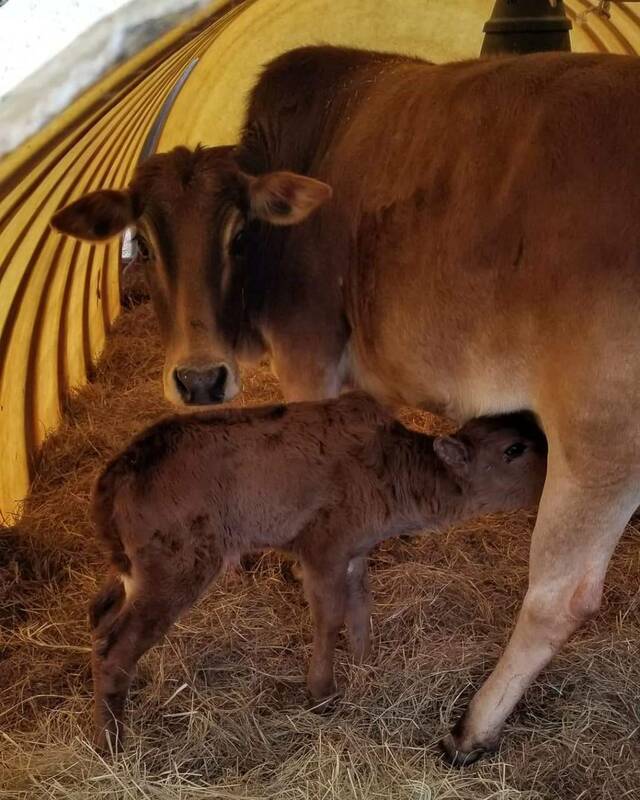 But she really started showing the signs a few weeks ago and since she is one of our unfriendliest cows, we moved her to the maternity pen as soon as we got a chance. We kept our steer calf in there with her for the first few weeks for company. Got baby breathing, then drug him into shelter, guided mom in there and then shut them up inside. Mom started cleaning him off and he tried to stand, so we knew we had done what we could. Obviously, they did well overnight as this morning he was all fluffy and latching on well to nurse. Mini Zebu herd, retired from a petting zoo. Pets only. Two updated pics. Both doing well. Mom is being very protective and returning to normal Psycho Penny as we call her. She threw us for a loop wanting attention and comforting from us up until mid-delivery. I love his little white feet and white tipped tail. Why are the boys always marked so pretty! Happens with goats too. Maple is wider then she is tall now! 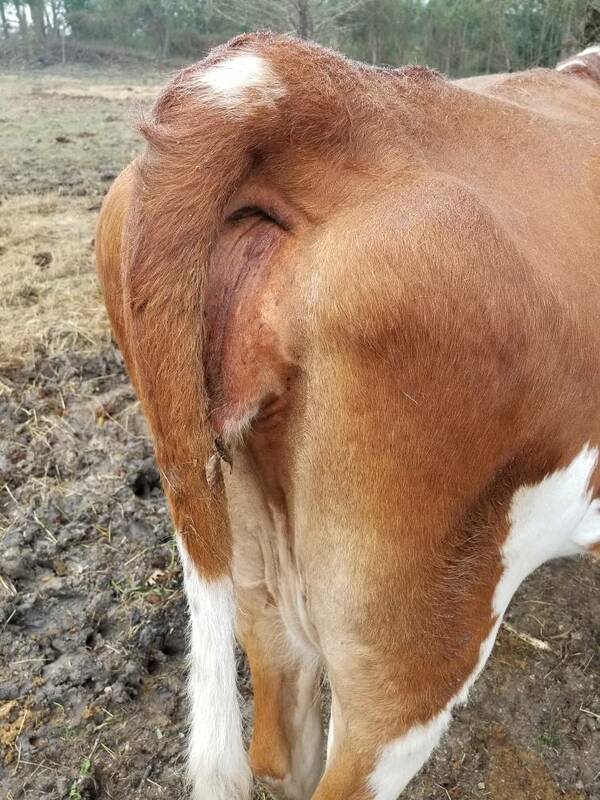 She's bagging up nicely, and her rear end is so loose I'm worried if she coughs the calf will come flying out. 19 more days till due date! Wish us luck. We have a first time gurney calf on the way in one week. Will post some pics after the big day. Any words of wisdom are welcome. We just had the opposite of Penny's story above. Ellie was showing no signs on Sunday. Yesterday my dad thought she was at the stage we should start watching for signs. And then she popped out a calf overnight! We finally got our little heifer. Mom is very sweet and so is baby. My parents got them moved and under heat lamps and I went home and gave her a coat. So happy! 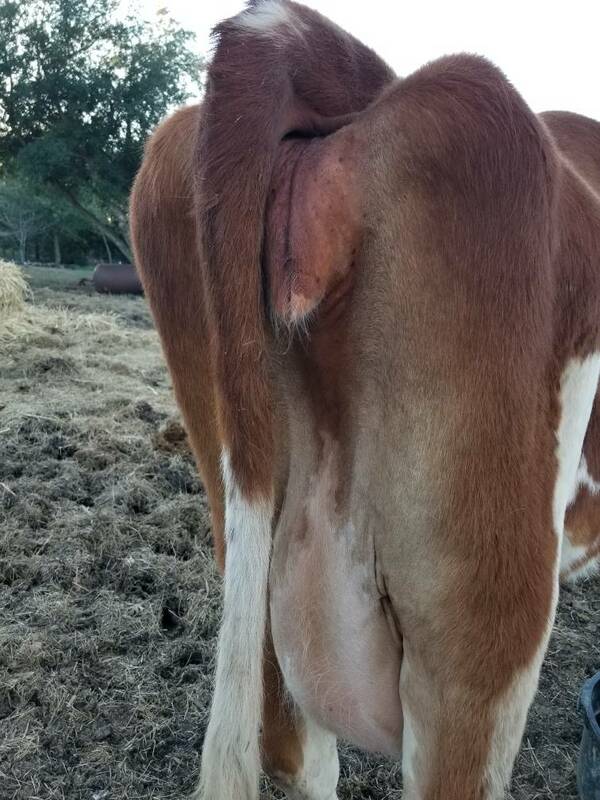 Congrats on that beautiful heifer. Love the jacket. Sooo cute!! That is one chunky momma cow! Haha. Yes, that she is. We aren't exactly sure on her cross, but previous owners were told probably Lowline Angus was the other part mixed with mini zebu. She thought we were staving her yesterday when she got fed by herself in a pen. She's used to pushing her way around and having some of everyone's! I have a lowline/jersey and she has the same build. Both them are adorable!! I'm thinking we'll have a calf this weekend. Dylan's so loose she could probably birth a calf my size without issue. Snickers looks like a fluffy poodle because Dylan won't stop grooming her. Dylan is such a great cow. 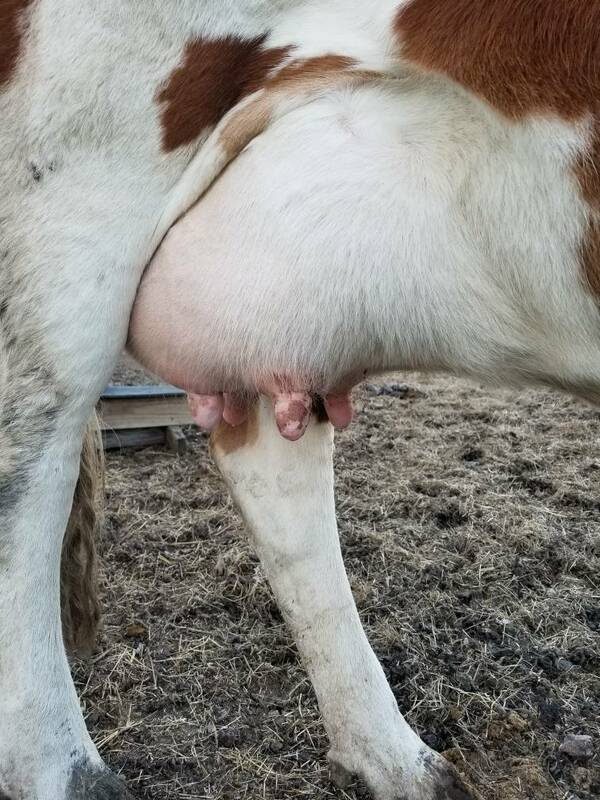 I can't wait to milk her!